Order in next 13 hours and 53 minutes for despatch today. 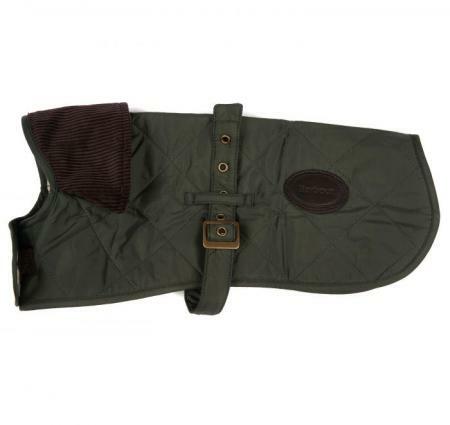 The Quilted Dog Coat by Barbour is constructed in Barbour's iconic diamond quilted nylon, with an insulating 70g wadding. Designed to keep dogs warm on winter walks, this stylish coat also features the traditional Barbour tartan lining in a lightweight cotton, and a smart corduroy collar that can be folded forward for extra protection in bad weather. An adjustable underbody strap and Velcro-fastening neck ensure a comfortable fit, and a premium leather badge adds unmistakeable authenticity. Available in a choice of two classic colours and a wide range of sizes (see size guide below).